I actually went Christmas shopping, with kids, on the weekend. Fortunately the residents of inner Sydney are late risers, and we were there before it got to the point where you have to strip yourself naked and cover yourself with chicken grease to squeeze through the crowds. We were successful in our purchases and were heading gratefully to the car when we passed a homewares shop. It contained ice cream moulds, something I’d been meaning to add to my collection of kitchen gadgets ever since I first made sorbet weeks and weeks ago. I avoided the ones shaped like adorable bugs and went for the ones in eight packs, mainly because they use disposable sticks. My memory of homemade iceblocks, apart from them not being very interesting due to consisting of home brand lemonade, is tarnished by the thought of the plastic sticks covered in the teeth marks of multiple mouths. 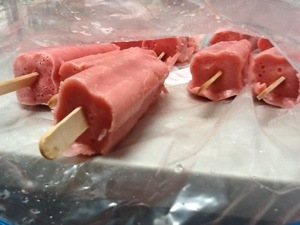 So far I have made Strawberry and Watermelon and Apple Cinnamon iceblocks. Truth be told, all you really need to do is whiz the fruit up in a blender, stick it the moulds and Bob is your uncle, or in my case, great uncle. But when do I ever pass up a chance to get fancy? They were utterly delicious and surprisingly creamy. They also melt quite fast, which makes me wonder what commercial iceblocks must have in them. Fortunately the volume is small, so none of it was wasted dripping down arms. I even went to the trouble of working out a cost per unit, just for kicks. Two dollars for the strawberries, about sixty cents for the watermelon, sixty cents of condensed milk and let’s say forty cents for a quarter of a lemon and the icing sugar. That’s forty five cents each for ingredients. What I need now is more paddle pop sticks. Pity someone wiped my brain while I was at the shops this morning. Bloody Fabians. I wouldn’t be surprised if commercial iceblocks and frozen yoghurts have some sort of gelatin or pectin-like substance added to thicken the mixture. Commercial iceblocks have all kinds of things added to them. I haven’t got any on hand, so I can’t look it up. 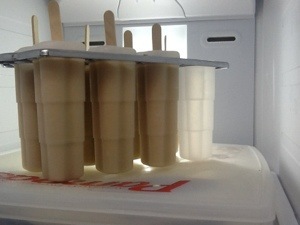 Fortunately my iceblocks are small and are being eaten fast. I am thinking of having a crack at freezing jelly, so we’ll see how that goes.